Addison Road Community Centre Organisation is pleased to announce a new joint initiative with Australian Muslim charity Penny Appeal Australia. Mums4Refugees will also be a major supporter. The new program, called ‘Mamma Penny’, will be available to the whole community, and will provide low cost groceries, and free fruit and vegetables, as well as support services and fun activities for families and children. This service will operate once a week from Belmore Youth Resource Centre, because of the high level of food insecurity and poverty, particularly amongst refugees and asylum seekers, people living on a Centrelink payments, and single-parent families in the Canterbury-Bankstown area. “We hope this new grass roots project will help turn back that trend, and extend the food security and social justice initiatives we run in the Inner West of Sydney to other areas, and serve as model for other community groups across the country,” she said. “We became major supporters of this project because we were witnessing first hand the difficulties the people we were trying to help were having just to be able to put a meal on the table each night. “I will always remember when we reached out to help a young Muslim refugee woman living in Lakemba with 5 young children, on her own. When we visited her, we found that she and her children had been living on nothing but rice and tea for the previous 10 days. She had no partner, no family, no friends, and was trying to raise a family with practically no money. She was completely isolated and desperate about the welfare of her children. 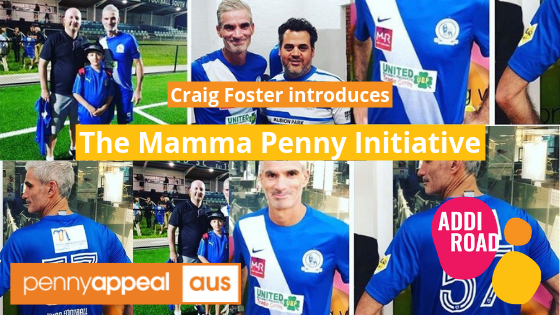 Craig ‘Fos’ Foster, ex Socceroo and Chief Football Analyst/Presenter with SBS ­- who was instrumental in getting Australian refugee Hakeem al-Araibi released from a Thai gaol in February after two months of imprisonment – recently put his boots back on and took to the field in Wollongong to raise funds for the Mamma Penny Project. ‘Fos’ will be attending Addison Road from 11am this Thursday morning, March 28th, to present a cheque for over $4,000 to Addison Road. He’s also offered to do a little hands-on work at The Food Pantry here – and meet supporters interested in hearing about the Mamma Penny initiative. “Supporting organisations like Mums4Refugess and Addison Road Community Centre’s Food Pantry is close to the heart of all in football as the game is built on multiculturalism and refugees. Sport can amplify important social causes and assist Australia in recognising and abiding by our international human rights obligations. And football, in my view, has to accept this obligation as the global game.” he said. Mums 4 Refugees has started a ‘Go Fund Me’ page to raise funds to provide support and fun activities for the women and children who will attend the ‘Mamma Penny’ service at Belmore/Lakemba.